With a crippling budget crisis, credit downgrades and lenders balking at buying V.I. bonds, getting new revenue sources online has been a high priority. Gov. Kenneth Mapp has asked for and the Legislature gave him some new taxes to help reduce the structural deficit. Gross receipts taxes and hotel room occupancy taxes have been increased in recent years. The V.I. Internal Revenue Bureau and the Office of the Lieutenant Governor are trying to increase delinquent collections. These all help. In February Mapp said the government has worked out a formal partnership with AirBnB, the room rental website to have AirBnB automatically collect occupancy tax at the front end. which could, optimistically, raise as much as several million dollars per year. All in all, the V.I. government has sought out new tax revenues where it could. Maybe taxes could go higher, although the business community in particular will howl that any increase will kill them all. The Senate reduced the administration’s recent increase proposals, trying to thread the needle of responding both to adamant business opposition and a growing fiscal crisis threatening the ability to make payroll. Anti-tax politics aside, no one questions whether there is some threshold of diminishing returns, where increasing taxes just reduces business activity or increases tax evasion. Cannabis, or marijuana, is already grown, sold and used widely in the territory. Decades of prohibition and ever increasing enforcement has not only been utterly without success but fed into a widespread distrust of police. In recent years the territory has decriminalized simple possession and deemphasized marijuana enforcement. But arrests and prosecutions for sale of marijuana are still common. The sale of contraband marijuana contributes to a general sense of lawlessness. On the mainland, 29 states and Washington D.C. now have some form of broad legalization of marijuana use, whether medicinal or recreational. Puerto Rico has medical marijuana. Recreational marijuana use is legal in Washington D.C. and seven other states. In November of 2016, California, the largest state, legalized recreational use after years of de facto legalization through lax medicinal marijuana laws. More are moving in that direction. According to the Denver Post, the state of Colorado generated $180 million in tax revenue from sales of nearly $1.2 billion in 2016, out of a $6.7 billion nationwide annual legal marijuana industry. It generated $220 million in tax revenue for Washington State in 2015. V.I. business groups have endorsed legalization and taxation of recreational marijuana. In February, St. Thomas-St. John Chamber of Commerce Sebastiano Paiewonsky Cassinelli urged legalization, saying it could generate licensing fees, sales and excise taxes, employment, employee income tax and new spending on construction. In 2016 Ken Phillips, a consultant for the St. Thomas-St. John Chamber endorsed legalized “adult use” of marijuana while discussing medical marijuana legislation that was held in committee. Philips told senators a Chamber study suggested legal adult use sales to cruise passengers could generate upwards of $10 million per year in tax revenues and up to $75 million to $100 million to the territory’s gross domestic product. The Source did a quick, rough analysis based on published national usage rates and a 100 percent tax and calculated somewhat smaller net tax revenues, perhaps in the $4 million to $8 million per year range. But many factors, including marijuana tourism, could inflate those numbers. A 2014 V.I. ballot question on support for medical marijuana was approved with 56 percent in favor to 44 percent opposed. At the time, 51 percent of Americans supported nationwide legalization of recreational marijuana use. Approval continues to rise. An October 2016 Gallup poll found 60 percent of Americans now in favor of legalization. More recent polls show 61 percent in favor. While support is strong, there is strong opposition within the USVI too. Some argue against legalization, saying children should not use it and society should not encourage it, as if the only two possible options were either giving it away with school lunches or locking everyone involved up like they were burglars or muggers. Alcohol and tobacco lead to addiction and death, yet are considered adult choices and important revenue sources. Gambling has ruined many. In 2008, former governor’s aide Alric Simmonds was sentenced to eight years in prison for embezzling money to feed a gambling problem. Yet the territory pins a lot of hope for development on slot machine revenues, despite getting little in the way of revenue from casino gambling. A few senators have indicated they would support legalization, but that the details need to be worked out. Only one: Sen. Positive Nelson, has actually proposed legislation to date. Some senators, notably Nereida “Nellie” Rivera-O’Reilly and Neville James, are on the record adamantly opposing legalization. O’Reilly tragically lost a brother to opiate use, as she has shared during Senate hearings. Many of us have lost loved ones to addiction. The problem is real and tragic. There are no cannabis overdose deaths at all. Cannabis is not heroin. But it can be addictive for some. Funding for addiction help is very limited in the U.S. Virgin Islands. There are too few mental health professionals of all kinds and too little access to all mental health care in the territory; a fact that many have linked to the proliferation of chronically homeless in the territory.Federal courts have mandated for many years that the territory provide better mental health care in its prison, but the level of care remains a problem. The budget crisis means more funding for addiction and mental health care is not coming. Statistics indicate marijuana does not cause or lead to opiate use and it is literally not possible to die of a cannabis overdose. This does not mean cannabis is harmless. Just that it is less harmful than cigarettes or alcohol, which are legal and widely sold and promoted. Walker’s dire prediction also ignores the fact that every young person in the USVI already lives in the actual U.S. Virgin Islands and not some imaginary fantasy version where the schools and bars and street corners are all drug free. Unless they never go anywhere but home and church, they already see people using cannabis on a daily basis. To pretend otherwise is just that: pretending. Legalization will not result in V.I. youth suddenly being exposed to cannabis for the first time. It will result in it leaving the street corners and rougher housing projects and going into licensed shops with signs on the wall saying they do not sell to minors. It also will remove marijuana from the realm of illegal dealers who also sell narcotics and have an economic interest in moving their customers from marijuana to harder, addictive drugs. If anything has cost a generation of young Virgin Islanders it is gun violence. Of 604 V.I. murders from 1999 to March of 2014, examined in an April 2014 study by the V.I. Source, alcohol was cited as a factor in at least 39 murders, typically in drunken fights after midnight at bars. In those cases, the effects of alcohol on the human brain appeared to lead to the violence. Cocaine was mentioned in police and news reports in relation to six murders and marijuana in nine murders. Protecting profits from illegal sales appeared to be the motives for the much smaller number of known drug related murders. The most common reason for murders, when there is any explanation, is retaliation related to ongoing feuds between groups of young men, accounting for 148 deaths. A known, personal fight between the killer and victim came in a distant second with 68 victims out of the 604. Robbery was the apparent motive in another 54 murders, and domestic violence killed 37 Virgin Islanders from 1999 to March of 2014. Although police do not appear to have strong evidence, many strongly suspect some of the violence is turf fights over profits from contraband. If that is true, removing the need to protect turf and profits and moving the industry into the light should reduce the level of violence, just as the end of alcohol prohibition curtailed the numbers of U.S. gangland shootings over alcohol turf and profits in the 1930s. We see very few gun battles over liquor turf today. A lack of opportunities for young Virgin Islands men who did not have the grades and resources to get a college degree has also pushed some to selling contraband. Criminalizing those young men who get caught gives them even fewer employment options to get ahead in life. People with few other options are more likely to try illegal ones, especially if there is a large market for it and lots of money to be made. This is not the story of most Virgin Islanders, but this cycle too has cost a part of a generation. Reducing the cash incentive for selling contraband by taking the customers away should help reduce criminality, as should providing more jobs in a legal cannabis industry. Walker has also raised concerns about possible problems with the federal government. President Donald Trump’s administration is more hostile to legalization than the previous administration was. It may be prudent to restrict moving marijuana into and out of the territory to avoid federal issues. Growing locally would increase local revenue more than buying and reselling too. But with a large majority of Americans now in support of legalization for recreational use, even larger majorities for medicinal use, and so much money to be gained, it would be surprising if the pro-business Republican party continues to support draconian measures. Cannabis is not harmless, as some claim. It is addictive for some. Studies suggest about 1 in 10 users become daily smokers, a similar rate of addiction as with alcohol use. It hurts memory, making users temporarily dumber. Studies suggest that heavy, long-term daily use over two or more decades may cause small but measurable permanent memory issues after use stops. It reduces motivation. Smoke is bad for lungs. The tar from other forms of smoke are linked to cancer and there is no reason to suspect cannabis smoke tar is somehow different and healthier. But cannabis is both less harmful and less addictive than legal alcohol and legal tobacco. Law enforcement prohibition has been utterly and totally ineffectual and marijuana is readily available night and day throughout the territory, as it has been for many decades. Resources spent on enforcement would be better spent on treatment services. And it can generate millions of dollars in real new revenue without putting more stress on existing businesses. Taxes can be increased on other commodities too – and the USVI has recently increased taxes on alcohol, tobacco and sugary drinks, over howls of protest. But the economy has not been robust of late and businesses have vehemently opposed new taxes, arguing they will drive businesses under and drive tourism to other locations. None of this is true of taxing cannabis, which is currently untaxed. Many in the V.I. business community believe legal, taxed cannabis would likely draw in more tourism, not drive it away. Legalization would not be a panacea. It would not generate enough to fill the deficit. But taxing it and devoting those taxes to mental health care and addiction treatment would be better than the status quo of ubiquitous cannabis and a never-improving long-term severe shortage of funding for mental health care and addiction treatment. So far, it appears unlikely the members of the V.I. Legislature are willing to take this controversial step anytime soon. This series has taken a long look at what the USVI might be able to do to cut costs, better allocate resources and raise new revenues. But some simple changes at the federal level could make a bigger difference than everything the V.I. government can do, combined. Unfortunately, the U.S. Congress would need to act in a coherent and thoughtful way, mostly by changing U.S. laws to treat territories the same as states for major government programs. With a non-voting member in a Congress and a Congress controlled by a Republican Party whose caucus is mostly pushing for sharp cuts to those same programs, it may be a difficult path. But there is much that could be done, if members of Congress could agree. 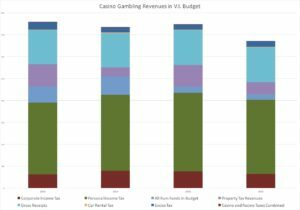 the chart “gambling revenues compared to …” is very very hard to read.I cannot tell what part of the bar is the Casino portion. The color of the Corporate income tax and the casino tax are so similar in the small box at the bottom, is just no way to tell any difference (yep, copied and printed the chart out and not any better) probably would have been better to show the color code as a stack on the bottom in the same vertical order as the chart bars. would have been clear then. also always appropriate to give a reference to the data source (Journalism 101???). “IRP and the Office of the Lieutenant Governor are trying to increase delinquent collections.”. Translation: Expect those responsible for tax collection to start doing their job, for a change. ” California, the largest state..” Huh? When did California get to be larger than Texas or Alaska? California is the 3rd largest state. “Attorney General Claude Walker opposes legalization. Walker is also on record arguing against any reductions in any criminal penalties under any circumstances. He told senators last year that he is ‘convinced that it will be a complete and total disaster for the children of the Virgin Islands and potentially wipe out an entire generation due to marijuana use.'”. A self-serving position. The AG needs business, and pot prosecutions are a source of business for his office. On the other hand, i the police and prosecutors focused on people blatantly running red lights, passing in no passing zones, illegal dumping, and avoiding paying property taxes by not painting their house (! ), there would be plenty of “business’ to go around. Speaking of property taxes, seems to me that if someone moves into the house, then it is right to reassess the house as “complete” enough to occupy, and the property taxes should be charged appropriately. It makes no sense to allow occupancy in house that is assessed as “unfinished” because they haven’t painted it (and never will), or they have a roof intended to support building a second story, with rebar sticking up, which also will never be “completed”. This policy only encourages leaving these housed “unfinished” eyesores. This loophole needs to be plugged. No moving in without an occupancy permit, and reassess upon occupancy! There are two parts to balancing a budget: Increasing revenues and decreasing spending. Clearly, the Governor is not on the page of reducing spending, at least not on himself. Presumably, the Senators control the budget – the Governor must not be allowed to spend money that is not budgeted, and the Senators should not allow it. Likewise, the salaries for most of the government officials is grossly out of proportion, compared to states, and most definitely outrageous for small Caribbean islands. They should be embarrassed to vote themselves such ridiculous benefits, and we should hold them accountable at the next election. Voters should use actual common sense when voting. Discussions on whether marijuana should be legalized in the V.I. and taxed as a source of revenues for the V.I. Government often overlook a legal obstacle one would face in operating a business cultivating and/or selling marijuana in the Virgin Island. That is using a bank to deposit their income and to pay their bills – even to pay their taxes. The article, which you authored “The V.I. Budget Crisis: Part 13: Finding New Revenues – AirBnB and Marijuana”, has such an omission. In order to address that omission, I am providing articles, which can be accessed with the links below, for readers to become familiar with the obstacle in federal law known as the Bank Secrecy Act (BSA) and the challenges it has posed for entrepreneurs in the marijuana industry.